PTFE is not a rubber compound, but a white thermoplastic resin which can be formed into various shapes by either machining or molding. It is a premium grade material which is often specified in harsh chemical environments where no rubber material is suitable since PTFE is impervious to virtually all fluids and gases. PTFE exhibits very low moisture absorption and can withstand extreme high and low temperatures. It also provides the lowest coefficient of friction of any seal material. One major drawback in using PTFE is its tendency to deform under a continuous load, a phenomenon commonly known as creep or cold flow. 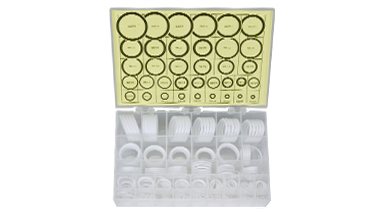 Our PTFE O-Ring Kit comes in a 325 piece assortment of various AS568 sizes. The kit’s contents identification card shows sizes and dimensions on the front and silhouettes on the back.